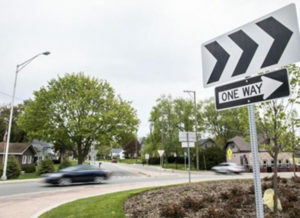 The roundabout replaced a three-way intersection that was controlled by a single stop sign, and it corrected Dowell Road’s extreme skew that made turning left from Dowell Road onto River Road diﬃcult and risky. Crashes at the intersection had increased 60 percent between the reporting periods of 2008 to 2011 and 2012 to 2016. The contract was awarded April 17 to PirTano Construction Company Inc. of Addison for $3.59 million, and work began in May after utilities were relocated. Project funding came from the McHenry County motor fuel tax and the county’s share of the regional transportation authority sales tax. Article regarding roundabout at River and Dowell roads in Island Lake.